Great for condos and low-water-usage homes. Work on 600 contaminants. FOAM ADVANTAGE Small Whole House Water Filters. Small Whole House Water Filters are right for Condos, Apartments and Smaller Homes with low water usage. Also known as the Whole Apartment Water Filters. All media has been processed using the patented method to greatly increase effectiveness of the best filter materials. Housings of the same size without that patented process cannot filter as much. All of these filter over 600 contaminants. Small Whole House Water Filters (whole apartment water filters) WORK ON HUNDREDS OF CONTAMINANTS. PLUS, THEY CAN BE CONFIGURED TO FOCUS ON ONE OF THE FOLLOWING: Extra Wide-Spectrum, or Fluoride, or Hardness or Arsenic or Nitrates or Chloramine. or GET THE 3-CANISTER VERSION TO FOCUS ON TWO ADDED CONTAMINANTS: Fluoride AND Chloramine OR Fluoride AND Hardness. Media lasts for 80,000 gallons. or CAN BE BUILT TO FOCUS ON RADIATION. The radiation configuration must be used in combination with an another whole house filter to do everything else. Don’t think that just because this system uses blue tanks, the filters are the same as others with blue tanks. It’s what’s inside that counts! This system uses FOAM ADVANTAGE media! 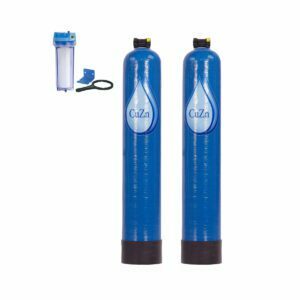 These whole apartment water filters deliver great filtration while allowing very strong water flow of 10 gallons per minute. They use a patented process on the media to greatly increase filtration in the same amount of space. See Foam Advantage Test Results and FOAM ADVANTAGE. As insurance to protect the main media, add an inexpensive prefilter. Over several years we have had two customers who had to replace their media early because the municipality did work kicking up a great deal of sediment. Add a $69 pre-filter. Click here: Sediment Pre-Filter. Plumbing and appliances are protected from staining, corrosion and scale, adding life to your household appliances including your hot-water heater. All filter media have been certified by the NSF. As insurance to protect the main media, please add a pre-filter. Over several years we did had two customers who had to replace their media early because the municipality did work on the pipes that kicked up a great deal of sediment. 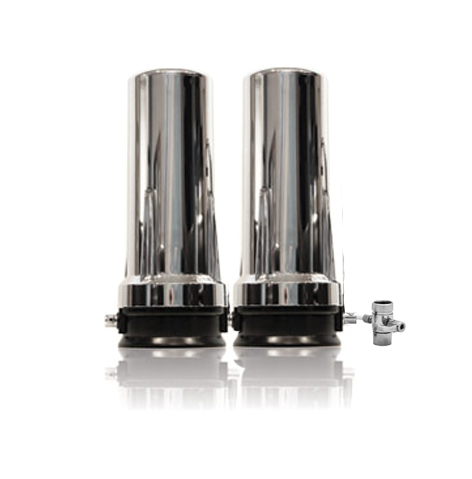 To get a $69 pre-filter, click here: Sediment Pre-Filter. All cartridges start with normal KDF and Carbon and then layer the appropriate specialty media with more foam carbon. Making the cartridges this way maximizes the efficiency of the medias. The “Extra Wide-Spectrum” version doubles up protection from the unexpected addressing Pharmaceuticals, Chlorine, Herbicides/Pesticides, Disinfection Byproducts (DPB’s) and other Organic Compounds. It’s comprised of KDF 55 foam and Carbon Foam. 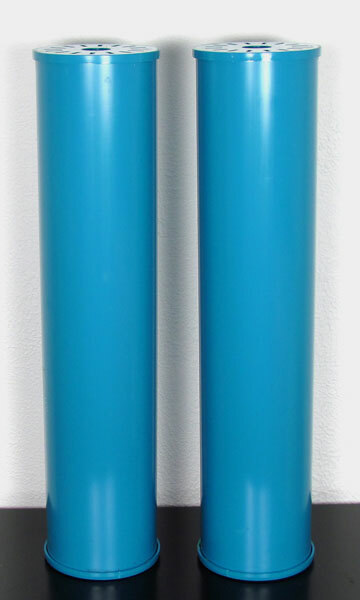 The Chloramine version has both cartridges with Kdf-85 Foam and Catalytic Carbon Foam. The combination of the patented processed kdf and carbon is highly effective against chloramine. The same amount of carbon without kdf would not compare in effectiveness. See the other tabs for lot more info. If you can have a question not answered here, email us at [email protected] or call toll-free 866-482-6803. The small home water filters are best for apartments or condos on municipal water systems – or for especially low-usage homes. 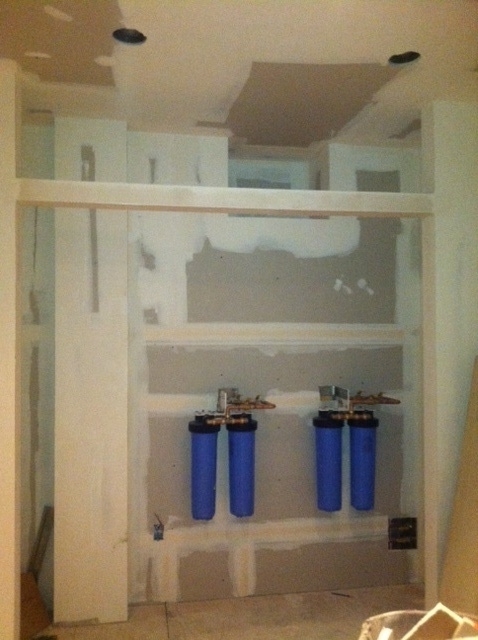 In a condo, you may have access to one or two pipes that provide all your water. but are limited in space. If there is no access to a single source water pipe, and you want this filter, you can get 2 SETS – one each for hot + cold water. (You can see two sets installed in one of the photos.) A single set can be used for homes with limited space and lower water usage. CAN BE INSTALLED LAYING ON THEIR SIDE for hard to fit installs! PLUS select the correct cartridge to ALSO filter out one of the following:FLUORIDE, chloramines, nitrates, arsenic, hardness – or extra wide-spectrum protection including pharmaceuticals. To see an larger indicative sample list of contaminants removed by these filters, see What Is Filtered? The small house water filters use ‘classic’ filtration. This means filtering happens as the water runs over and through the filter media. This is similar to water being cleaned by running through Mother Earth. Filter media are chosen and combined because they remove contaminants but leave the trace elements that the body needs. There is a major difference with this series. These filters use the patented process to powderize and shape some of the filter media into a foam-like material. These ‘foam’ disks greatly increases contact time between water and filter material, which means increased and longer-lasting filtration. It also does not compact, therefore water flow rates stay strong. 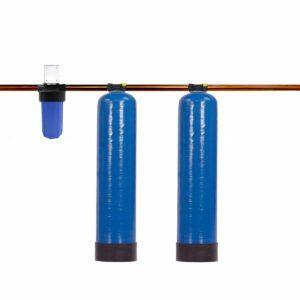 These are combined in appropriate balance to assure effective filtration and continued strong water flow. 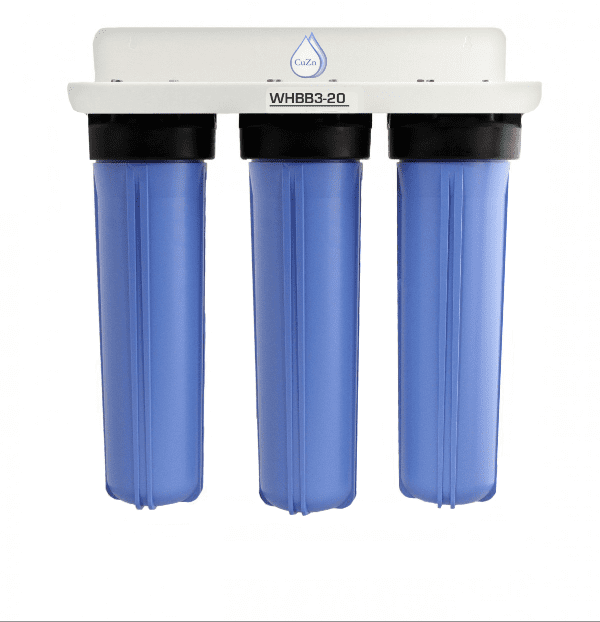 This system works better than most because there is both high flow AND more contact time between water and the top-quality filter material. Filtration happens by contact time between the water and the filter material. 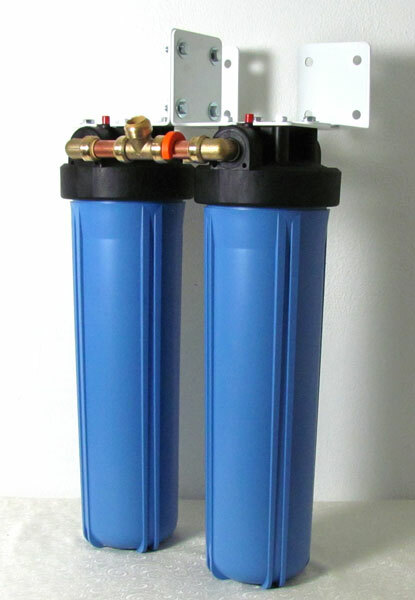 The patented process increases contact time between water and filter material, thus you get more filtration. The types of filtration include magnetics, catalytic action using reduction-oxidation, electroplating, ion exchange, reshaping of hardness ions and adsorption. An environment is created which is bad for bacteria, algae and fungus. Every unit contains kdf and carbon. Kdf is a great filter material that is particularly effective on chlorine, heavy metals, chemically-based contaminants and scale. Kdf is bacteriostatic, and adds to the life and effectiveness of carbon. Granulated coconut carbon is particularly good at filtering organically-based contaminants. Kdf makes carbon more effective and longer lasting. Because kdf is bacteriostatic bacteria can’t breed in the carbon. Hardness is addressed by the great newer filter material called TAC, or Template Assisted Crystallization. Reverse osmosis, which uses membranes, is not involved. Water is not stored to be drawn down. Clean water is always available in whatever quantity you need. 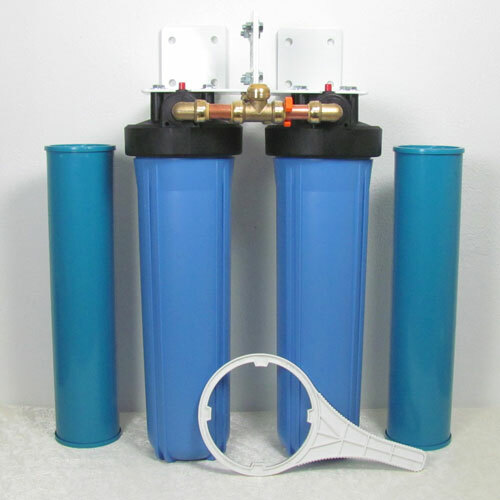 See Reverse Osmosis for more about membrane filtration. All filter parts are included. You need a plumber and he may need some plumbing parts depending upon your situation. * Water flow is up to 10 gpm! * Housings can handle temperatures of 140 to 160 degrees! Designed to sit on a flat surface with flexible piping so you can later change filters easily. OR use the attached L-bracket to secure it to the wall. OR can be installed to lay horizontally. Nearly 10 months after installing our 3 cartridge small whole house water filter system, I am in awe at how amazing our water is. I knew that it would be much better, but how much better – just wow! Our water is crystal clear, no smells, no taste, no floating whatevers – refreshing! Boiling potatoes, pasta, beans, the water is cloudy only from the starches, no brown, gross foam on floating anymore – I thought that was normal until I boiled water after installing our new system! I feel that the taste of our food is greatly enhanced because of this too! We specifically chose the 3 cartridge small whole house system that targets fluoride and chloramine. Our city adds ammonia which together with the chlorine is chloramine and they add fluoride, I was having some thyroid problems for which those 2 chemicals (along with other chems/additives/etc in our drinking water) made things worse for me. All the water pipes in our home have been changed out but we still have older service pipes from the street to the house and had some concern with lead and other contaminants because of this. We invested in this particular system, because it ticked all the boxes for me. 1. Removes nearly all of the things I don’t want in my water. 2. Filters the whole house and not just targeted to certain areas of the home. The skin, the largest organ in/on our body needs to be healthy and I didn’t want to drink the water any more that I wanted to bathe in it. Or give it to my cat or grand-kids or anyone! My hair & skin appear to me so much healthier too. 3. 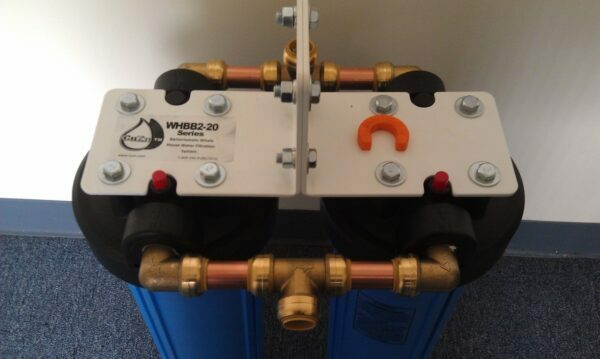 This system has been designed to be installed in apartments/condos where the main water supply is available and can be installed side-by-side or one on top the other – so it fits into smaller spaces. Though space wasn’t a huge problem for us, the size was perfect for our household of 2 plus cat. 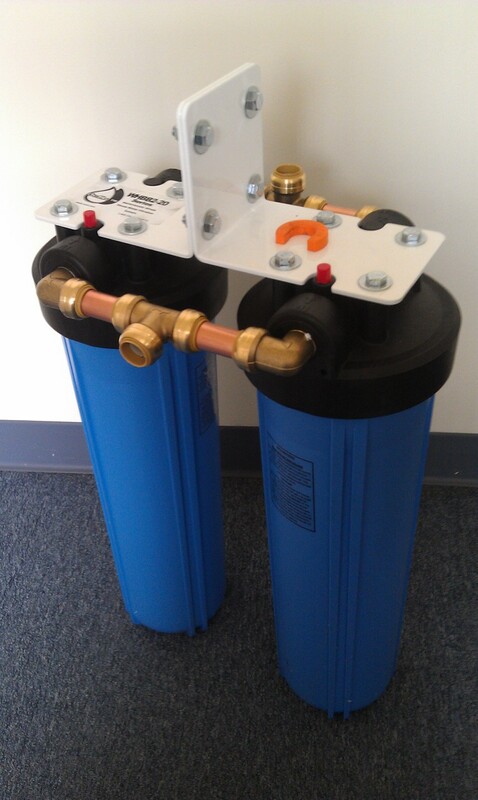 This system is rated for 80,000 gallons of water before filters need to be replaced. And after averaging our water use out we’d need to replace the filters in about 5 years! 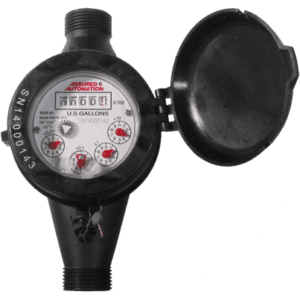 We were limited on how much money we were able to invest and Friends of Water was the only company we found that had this smaller system available. There’s No change in water flow either. I was worried about that because our water flow is not the best – but no noticeable water flow change at all. 4. We wanted to save money – our initial investment and the install (my hubby did it) that included all fittings, etc was almost $1000 – sounds like a lot until I did the number crunching. We were spending about $120 a year for refrigerator filters and another (approx) $280 a year in water pitcher filtration. So in 4.5 years we would have expected to spend about $1800 in water filters for just the fridge & a pitcher! That’s a lot of dough just to remove taste & chlorine! We’re filtering out so much more than taste & smell with this system and we’re saving an extra nearly $180 a year – I’d day that’s a win win! AND, we will most likely save more later when we change out our filters. 5. This enhanced filtration will make it possible for me to make my own (healthier) fermented or cultured foods like yogurt, kefir water, kombucha or sourdough starter, etc. 6. We were looking for a system where changing the media would be simple. Changing the filters with this system will be a cinch! We can do it ourselves and there no need to dump a barrel of media out and refill, just turn off water to the filter system, unscrew, take out old filter – put new filter in, turn water back on the system and go! 7. We can take this system with us if/when we move, if we want to. Or leave it – that will be a nice selling feature too! 8. Friends of Water has great info on their website – and I was able to find other info backing up everything they were explaining. 9. When I called them because I had a few more questions, They answered the phone. SO I could get my questions answered on the spot! No hard sell either, just the answer to my questions. Bottom line & only 1 regret – We are so happy that we did this – and wished he found this company so we could have done this sooner! Thank you Friends of Water! We are loving our Small Whole House Water Filter. We do not have a small house and yet, opted to get this unit instead of the ones designed for larger houses. Here’s why. I was in the market for over 3 years looking for the right filter for our needs. 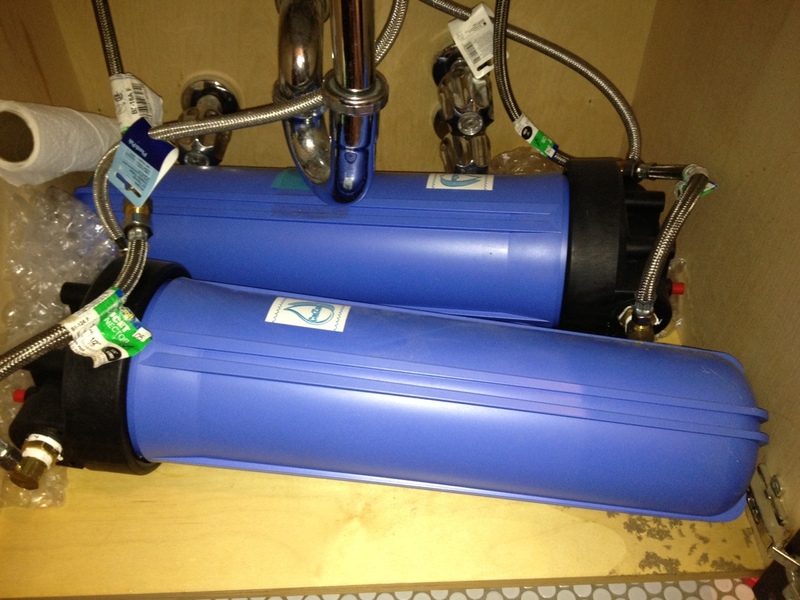 We need to have a 3 filter unit as our water contains Chlorine, Chloramine and Fluoride too. I looked around for stable units that were well made as I a friend’s boss put in a whole house water filter and then had a problem with bacteria building up in the pipes. They needed to treat the bacteria to save all the pipes in her house. It was a difficult situation. Many people cautioned me against WHWFs for this reason and suggested to only use point of entry filters. I almost gave up on the option of having a WHWF. However, I wanted to be able to not only drink clean water, but to also shower and use clean water in the bath too. It took over 3 years and when I found Friends of Water I knew I found the right place and right water filter system for us. First Timothy listened and made sure we had the filter for our needs. I wanted to be able to switch out and change the filters more often and still have it be cost effective. Timothy suggested the smaller filter so we could change the filters more often. This ideas is working out wonderfully; after 10 months we switched out the filters and it was SO easy and I feel safe with the built in bacteria-static guard and changing our filters more often, that we will not have other bacteria infest our pipes. Additionally, the water is the best tasting I have come across (and I have tested a lot of filters). I am very grateful to Friends of Water for the choice of a smaller WHWF that we can change the filters more often, great tasting water and wonderful, caring customer service. All in all a great company and great products!! Thank you.